The Boho Owl Quilt-along continues on the AmyQuilts Facebook page (I recently changed the name to make it easier to find and match our online shop) and this week I switched machines and used a smaller machine. 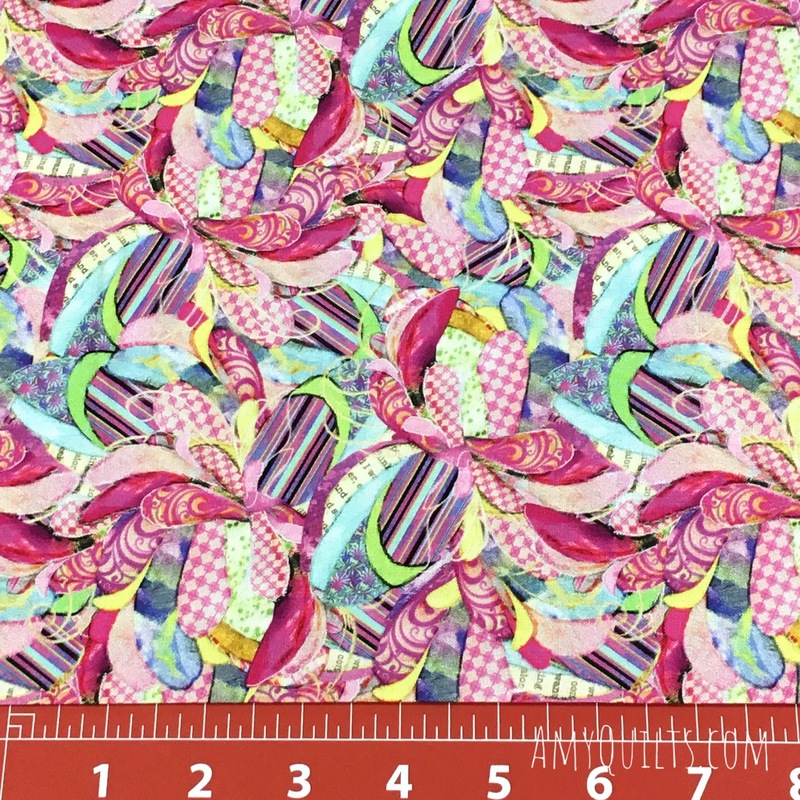 This project is 60x60, so there's still plenty of room to free motion quilt on a regular sized machine. The machine I used is the Janome 4120QDC and I fitted it with the Janome Convertible Free Motion Foot Set for low shank machines and used the open toe on it. 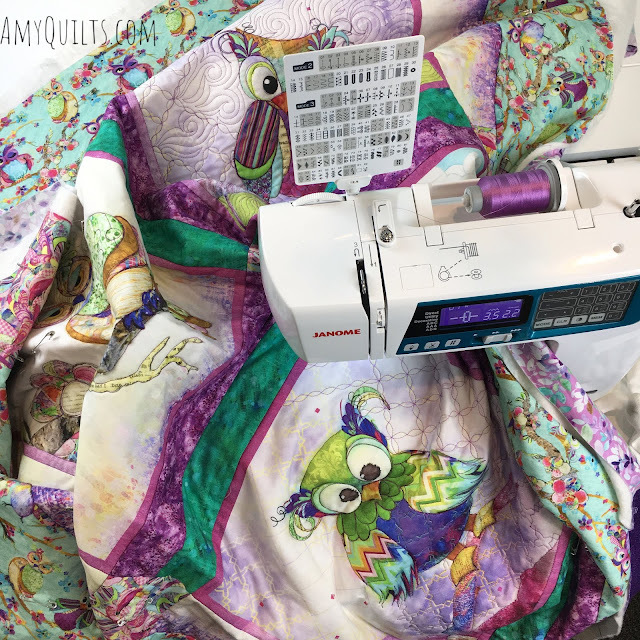 A big difference when using a smaller machine is that even when there's still plenty of room to stuff a quilt under the throat of the machine, there's not a lot of room to move your right hand side to side. This makes the range of motion smaller, so your designs typically are smaller, especially as you move laterally. Making designs that run forward and backward are easier. Below are a couple of shots from previous video sessions. A little McTavishing in the green portion under the first owlet. Farther up in the background I did swirls on the right side, and a curvy orange peel variation on the left, like what I use in the first photos of this post. 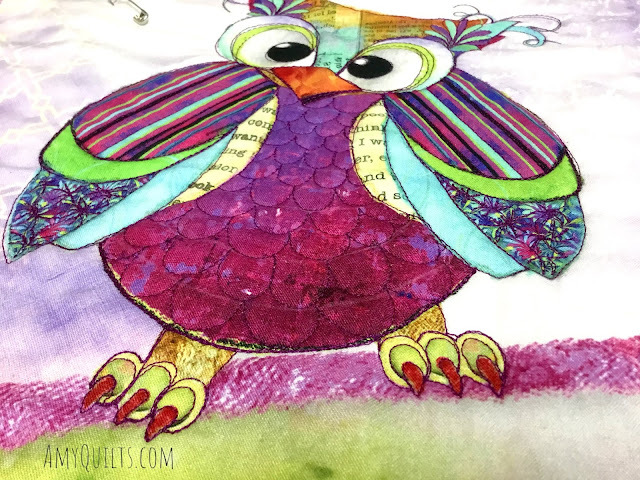 I love keeping the sketchy nature of these owls as I do my quilting. Keeps it fun. I enjoyed this flower detail below too. I used the printed design as my plan for this area of quilting. In a couple of places, the background design disappeared entirely, so I had to draw it with my trusty purple pen. 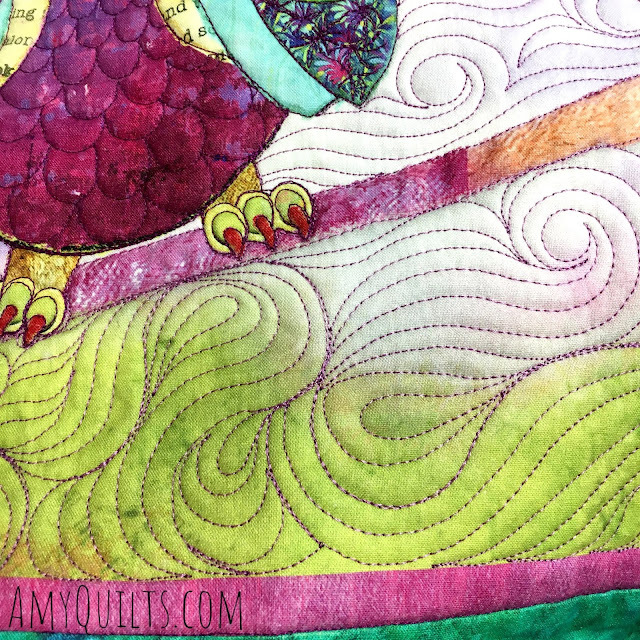 It's been a lot of fun to do this quilt-along via live FB video, though there have been a few technical issues. I love being able to interact with so many quilters this way. I go live on my AmyQuilts FB page each Saturday at 6pm and Wednesday at 7pm, both eastern time in the US. Wheee! This week's (September 26) quilt-along video was fun. 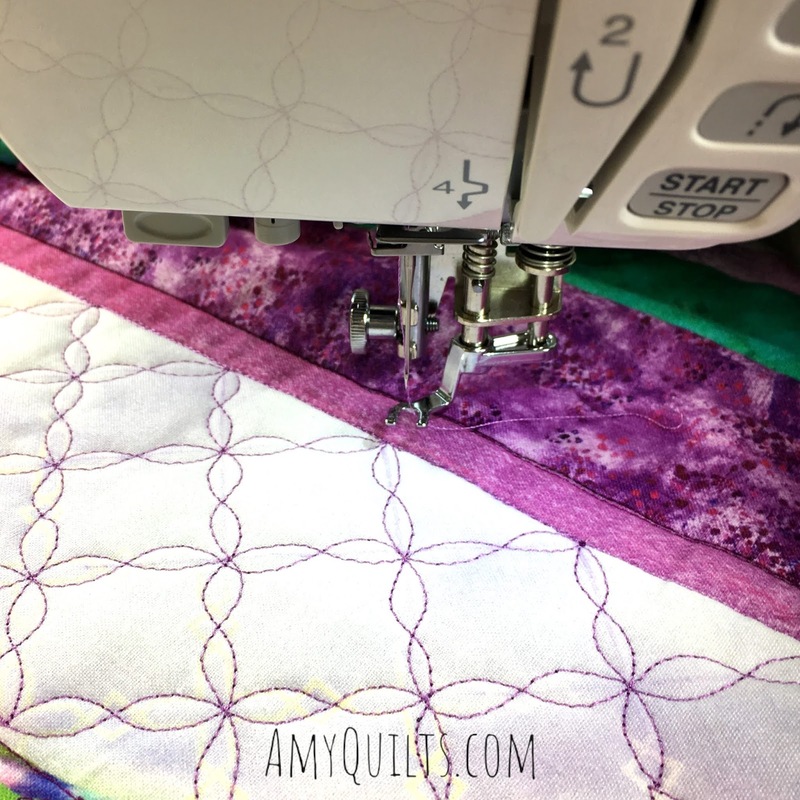 After stabilizing the quilt in week 2 with stitch in the ditch quilting (SID) using my AcuFeed SID foot (my machine's built-in version of a walking foot), it was finally time to play with free motion quilting. Don't you just love his googley-eyed face? 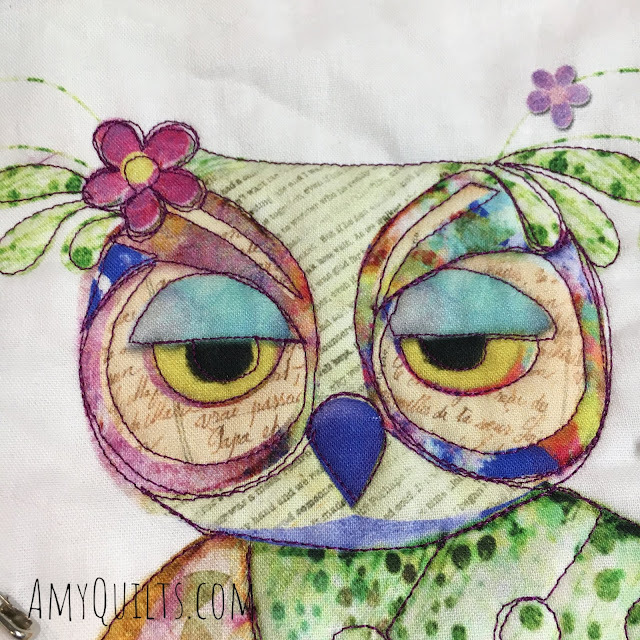 You can catch the replay of the live video on the Amy's Quilting Adventures FB page. 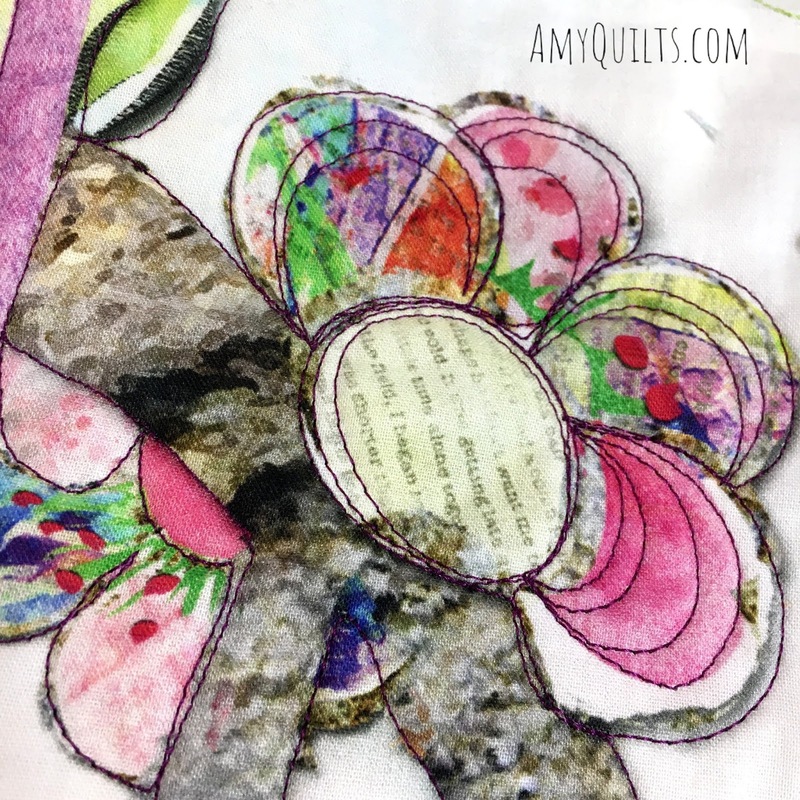 It's right at an hour long and I talk about the choices I make for the quilting while I make them. 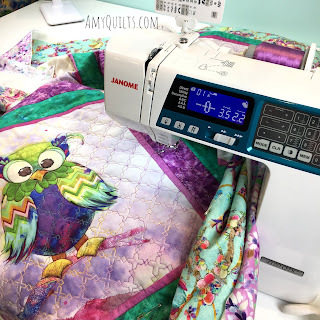 I also talk about a few basics of setting up for free motion in general, and then some details about setting up for free motion quilting on the Janome 9400. Then I quilt the entirety of this owl on camera. 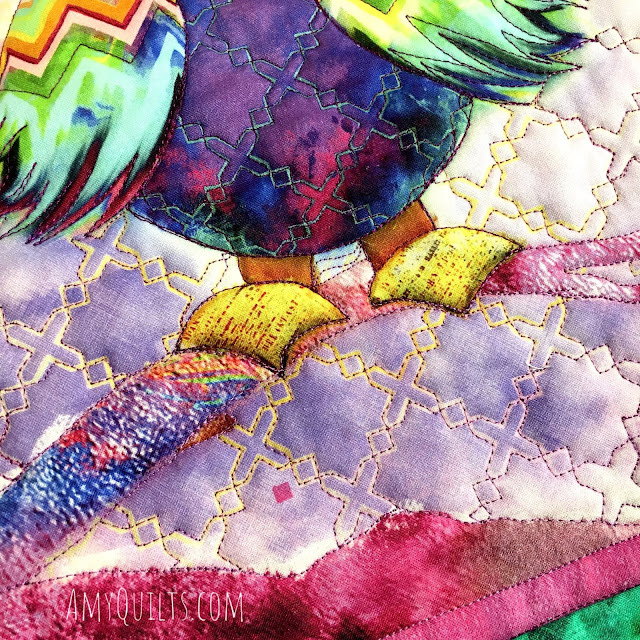 He was pretty straightforward to quilt, mostly just outlining the different shapes but getting a bit creative with the feathers on his tummy and adding some highlights to that multicolored print at the tips of his wings. I kept the lines "sketchy" meaning they don't need to be right on top of the printed lines. This made it easier to stitch, to stay relaxed, be fun, and I think it fit the aesthetic of the panel. I'm still using the dark violet thread so most of the stitching is pretty visible unless on the violet or black printed areas. I stitched up some freehand clamshell-like feathers for his belly and if you look closely, you can see a bit of the white pencil I used as reference lines. I started with two rows of clamshells and then went to one row per line as the feathers got bigger. I also began to curve the lines to follow the curve of his tummy. I am sorry that we ran out of this panel so quickly. 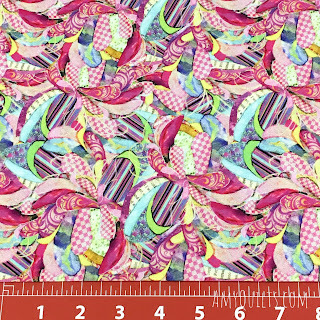 I had no way to know how many of you would want to join in and since the panel is stinkin' cute, the fabric company ran out after my second re-order. We do still have quite a bit of the below companion print if you need something for your backing. 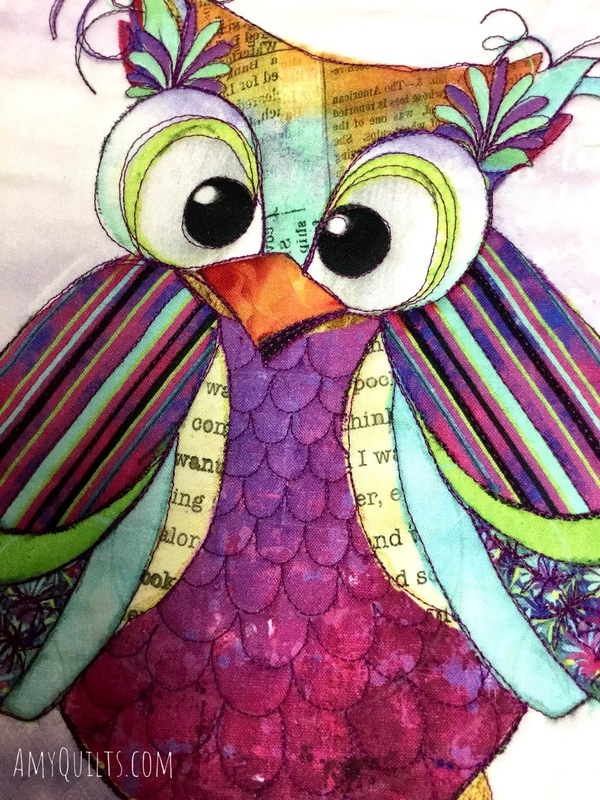 The response to this quilt-along has been wonderful! 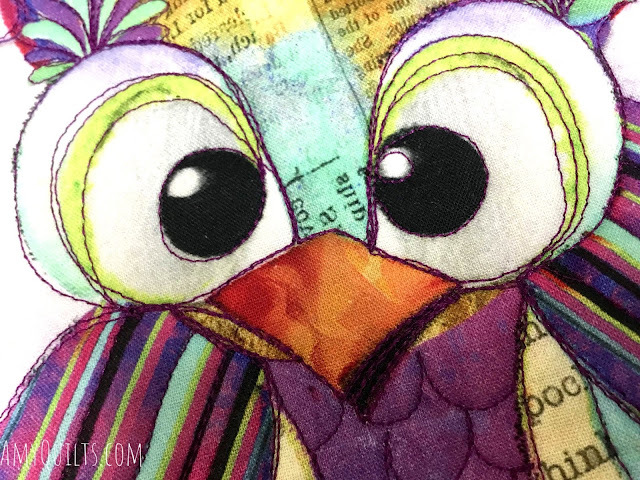 Whether you bought fabric or are just following along to watch and learn, I am encouraged to do more of these. It's so fun to stitch and answer questions together. I am always a bit timid in telling people what to do and how to do it (there are a myriad of ways after all!) but as a teacher, there is a need to do just that to some extent. So I'm glad to get such positive feedback.